I absolutely love the look of a photo canvas – sleek and simple without a frame and it goes with any décor. So, when I found this tutorial on Pinterest on how to make your own, I definitely wanted to give it a try! 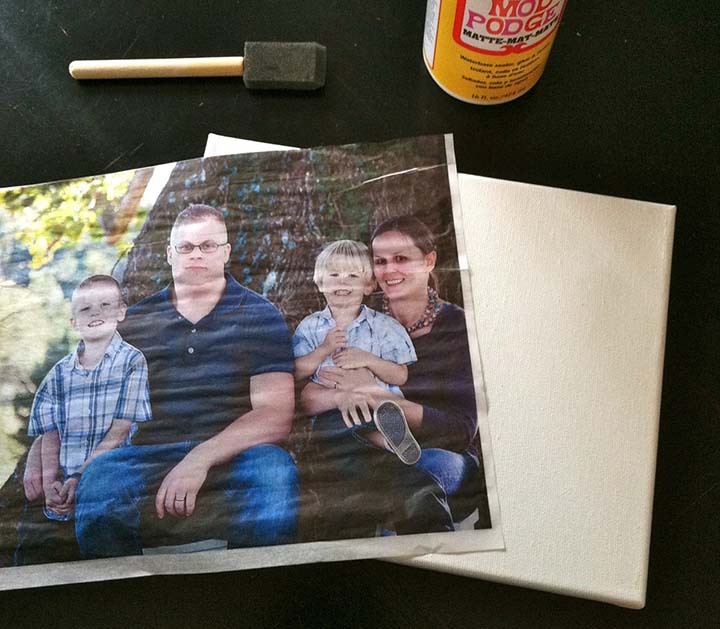 You can click on the photo to read the entire tutorial from Little Bit Funky, but essentially all you do is print a photo on tissue paper and then Mod Podge it onto a canvas. Sounds simple enough, right? 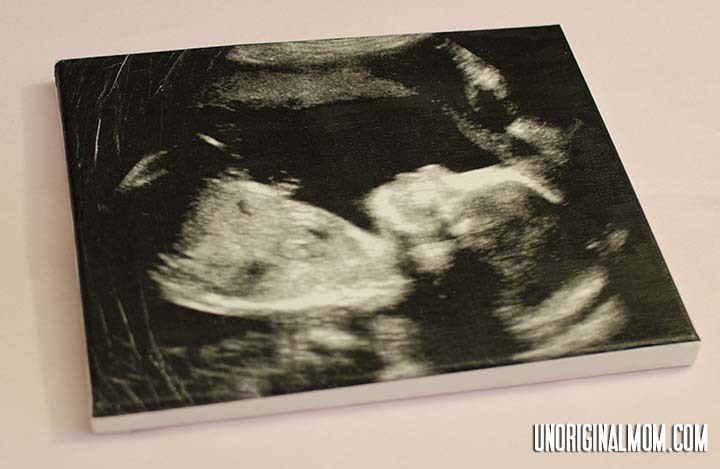 So, while this wasn’t going to work for any regular photo, I decided to give it a go with our ultrasound picture to put in the nursery. It did wrinkle up a little bit, but I was able to fill in some of the bigger wrinkles with black sharpie so it wasn’t quite so obvious. Then, as the tutorial instructed, I Mod-podged it onto an 8×10 canvas…and it actually looked pretty good! 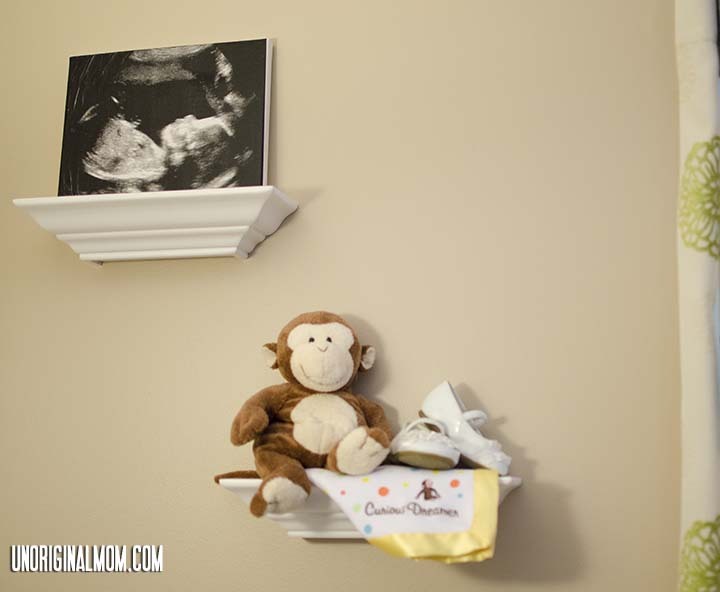 But I put it high on a shelf in the nursery, and it looks great! I don’t have a definitive rating on this one. For me, it was a loser, since it didn’t work with a nice B&W photo like I wanted it to…but I think if you had a nicer printer and had the patience to get the tissue paper really flat and smooth, it could work. Mod-podging the tissue paper onto the canvas created a really neat effect, and it could actually pass for a real printed photo canvas, IF you can get a photo to actually print well on tissue paper. So, readers, I think you’re going to have to try this one for yourself! Let me know how it turns out!